Based in Brooklyn, NY, Eden is a new creative force exploding on to the Jewish Rock scene. Their soon to be released debut record "Tree of Life" is an eclectic mix of alternative and hard rock following the musical influences of bands like Incubus, Creed and Pearl Jam. The message behind the music promotes spiritual growth, acceptance of fellow Man, and closeness to Hashem. Tel: (718) 757-7590. Web: www.edenmusic.net. Eden Mi Qedem is the cutting edge in simcha-music, offering the highest quality mix of Jewish and secular music with traditional sensitivity and modern appeal. We specialize in events with diverse crowds and mixed tastes and ages, being possibly the only band that plays Chassidic, Classic Rock, authentic Mizrahi(Sephardic), Israeli, and Jazz, with the same passion and skill. Although we are based in Jerusalem Israel, we also perform at simchas and festivals internationally. We invite you to browse our website, watch our videos, and hear the music samples. Tel: 972-545-224-385. Web: www.edenmiqedem.com. Ma Sarah et les Egarés, Paris, France, are a french band playing a new kind of jewish music made of yiddish songs, classical arabo-andalous songs, hebrew, judéo-espagnol … with an amazing singer! Tel: (France) 066 2801 456. Web: www.myspace.com/lesegaresparisgrenoble. The Epstein Brothers were the reigning zeydes and great-zeydes of Jewish music. The Satmar's favorite band in the Sixties finally retired to Florida in the Seventies with their friends, and kept playing through the '90s. You can still catch the movie, A Tickle in the Heart, produced by Stefan Schwietert in 1996. 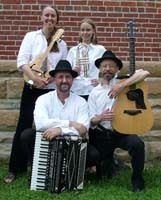 Even better, there are a host of recent recordings by the band that capture the magic: Kings of Freylekh Land (1995), Zeydes un Eyniklekh (with Joel Rubin, 1995), and their cassette, Klezmer Music II (1996). The most recent recording is a remastered double-CD of material going back over their entire career, Epstein Brothers / Volumes III - IV.